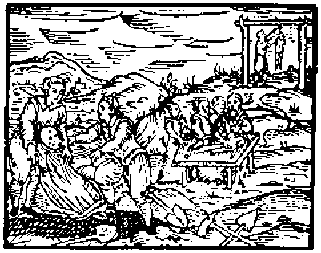 The rain-making powers of the witches have hardly been noted by writers on the subject, for by the time the records were made the witches were credited with the blasting of fertility rather than its increase. Yet from what remains it is evident that the original meaning of much of the ritual was for the production of fertilizing rain, though both judges and witnesses believed that it was for storms and hail. 'that the elements are obedient to witches, and at their commandement; or that they may at their pleasure send raine, haile, tempests, thunder, lightening; when she being but an old doting woman, casteth a flint stone ouer hir left shoulder, towards the west, or hurleth a little sea sand vp into the element, or wetteth a broome sprig in water, and sprinkleth the same in the aire; or diggeth a pit in the earth, and putting water therein, stirreth it about with hir finger; or boileth hogs bristles; or laieth sticks acrosse vpon a banke, where neuer a drop of water is; or burieth sage till it be rotten; all which things are confessed by witches, and affirmed by writers to be the meanes that witches vse to mooue extraordinarie tempests and raine'.